The Switch is a high concept rom-com that might seem a bit, “I’ve seen this before,” but its great performances, fantastic heart, and the most realistic characters in a rom-com, in what feels like forever (save 500 Days of Summer), make this a quality effort that is easy to enjoy. Now we have all seen the preview for this and there is only one thing that the trailer is selling, Jason Bateman’s character, Wally, swaps his sperm for that of his best friend’s donor and seven years later the kid and friend re-enter his life after a Midwest hiatus. Jennifer Aniston plays the best friend, Kassie, and while Wally and hers’ relationship started on a dating level, Wally quickly pushed them into the friend zone and they have been best-ies ever since. I believe, and the film clearly conveys, that the two have become platonic over the years and Wally has no ulterior motive to their friendship. What does hurt Wally is that Kassie doesn’t deem his sperm good enough to be the donor, and while I think in the end they would have decided it wouldn’t be a good idea for him to be said donor, Kassie never once considered him; and that rubs Wally the wrong way. So when Wally gets drunk and spills the “Viking” donor’s sample down the drain he replaces the “Viking” seed with his own out of guilt, embarrassment, and a little bit of spite towards Kassie. Not once did I ever think he was trying to weasel his way into Kassie’s romantic life/new family and he was clearly so hammered he didn’t even know what he was doing anyways. You might be wondering why I am getting into all of this in such detail, well it’s because I am being a tad reactionary in my review. I hate to be responding to other people’s critique in my own, and this is usually easy since I avoid most everyone’s reactions till I have written my own. But in the brief glimpses I caught of a couple opinions they really got me disagreeing with their assessment of the film. Sadly in today’s mainstream/studio driven American film culture we expect and think we have seen most movies before we have ever actually watched them and I think some people are taking their preconceptions on what they think this film was going to be and applying that as did happen in The Switch. When in fact, I think the film makes it very clear that it isn’t trying to make some generic, familiar arc, contrived and clichéd romantic comedy. Yes I can easily see how watching the previews you could sit there and say, “Oh I know how this is going to go,” and I will admit the film doesn’t do anything innovative or radical structure wise to the romantic comedy formula. But what it does do that is radical for the genre is that it makes everything in the film feels honest, the characters are as real as you will find for the genre, and the plot isn’t contrived for convenience of story telling. The film spends its first act building up the relationship and individual personalities of Wally and Kassie and I think the filmmakers, Josh Gordon and Will Speck, do a great job of making these characters feel real and right for their story. The middle act is the transition back to NY for Kassie and the initial confusion of Wally as he sees himself in Kassie’s kid, Sebastian, and his putting together the pieces of how that is possible; remember he was black out drunk during the switch. The final act is what seals the deal for me though as we watch Sebastian and Wally bond. Bateman and Thomas Robinson, who plays Sebastian, are just wonderful together and you will be unable to resist their courtship of one another. The Wally/Sebastian angle is what makes this film great, but I think the other relationships in the film are portrayed organically and follow their paths for all the right and natural reasons. I have already laid some praise for Bateman and his little co-star but I can’t herald them enough. Bateman throws this movie on his shoulders and carries while continuing to show that he can lead a motion picture. 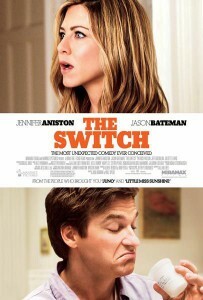 Aniston might have top billing but Bateman is the star, creating a unique character for himself but still possessing the actor’s winning comedic timing and humor. Robinson successfully, or comes this close, to stealing every scene he is in and he is one to keep an eye on as he is great here. The film completely won me over in these two’s fantastic scene surrounding lice. Patrick Wilson plays Roland, the donor, and while he is a bit peripheral he does a great job of taking advantage of all of his moments while also creating an honest “other guy” that we can buy into why he never becomes “the guy.” Aniston is Aniston. Solid as always, though she doesn’t stray out of her comfort zone all that much here; but I like her and she does nothing wrong with her performance. Jeff Goldblum is also hilarious as Wally’s best friend and I just am baffled that he doesn’t get to be in more movies; especially comedies. In the end, The Switch is a heartfelt and affecting family dramedy with a rom-com back bone. While the films progression might be familiar it is readily earned along the way with some of the most realistic and honest characters around for the genre. Bateman and Robinson are wonderful here and have great chemistry on the screen and I defy you not to fall for these two. Sure the film could have been a bit more innovative and thrown a curveball here or there but the film isn’t trying to surprise you. It’s trying to make you laugh and win your heart and it definitely succeeded on both of those levels; marvelously.